SEOUL, Nov. 5 (Yonhap) — Asan Mugunghwa FC, a second division football club run by South Korean police, were given a two-week deadline by the professional football office on Monday to come up with a recruitment plan that will ultimately decide their first division promotion. The K League said after a board meeting that it ordered Mugunghwa to submit their recruitment plan for the next season by Nov. 19 if they want to earn promotion to the K League 1. 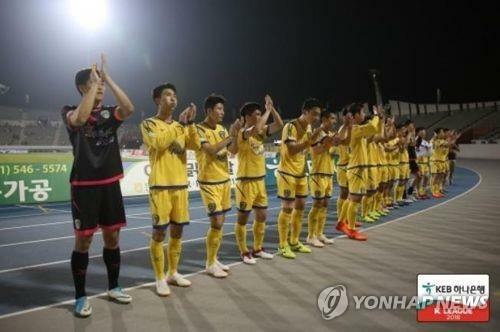 Mugunghwa won the K League 2 title on Oct. 27 with two matches remaining. The K League 2 champions are directly promoted to the first division, but the league office said if Mugunghwa can’t submit their recruitment plan by the deadline, the runners-up, Seongnam FC, will be promoted to the top flight K League 1. Usually, the K League 2 runners-up need to go through playoffs to gain promotion. They first have to face the winners of the third and fourth place playoff and then take on the 11th-ranked team in the K League 1. But If Mugunghwa are disqualified from promotion, the league said No. 3 Busan IPark will go through the playoff rounds, facing the winners of a fourth and fifth place playoff and later the K League 1 team. Mugunghwa, managed by the Korean National Police Academy, were founded in 1996 with the purpose of helping footballers stay in the game while fulfilling their mandatory military duties. The players who join Mugunghwa are part of the auxiliary police, completing their national duty as police officers after finishing basic military training. The South Korean government last year announced it will abolish the auxiliary police by 2023 and that recruitment will end by 2022. But the National Police Agency recently ordered the police academy to stop recruiting athletes immediately and disband its sports teams by next year. In order to compete in the K League, a team must have at least 20 players. But without new recruiting, Mugunghwa will fall short of that number. They currently have 26 players on the roster, but 12 of them will be discharged in February. The South Korean football community has been asking the police to have a probation period for the next two years and gradually reduce the number of players. Some 300 football officials, coaches, players and players’ families staged a rally on Friday near the presidential office asking for support for the police club.